The Bureau of Land Management administers wild horse ranges all over the West. 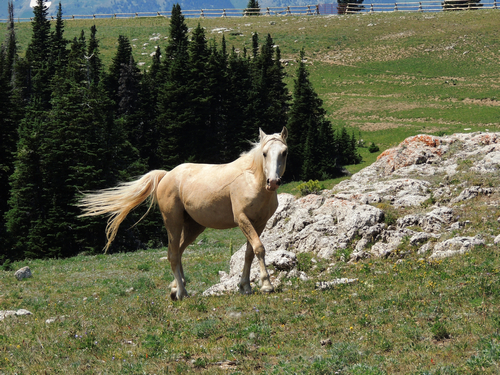 The Pryor Mountain Wild Horse Range straddles the Wyoming-Montana border between Yellowstone and the Bighorn Mountains. 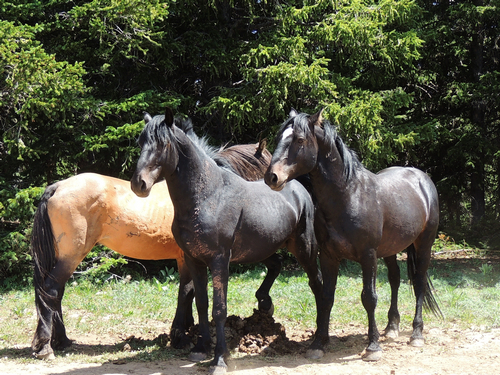 The Pryor Mountain Wild Mustang Center is a private advocate group for this herd of horses. Good info here! They have every horse named, AND CAN TELL YOU WHERE THEY ARE LIKELY TO BE. Make sure to stop at the Center in Lovell before going to the range. The Pryor Mountain Wild Horses are unique. Cortez once said "...Next to God, we owed the victory to the horses..." in discussing his conquest of the New World. 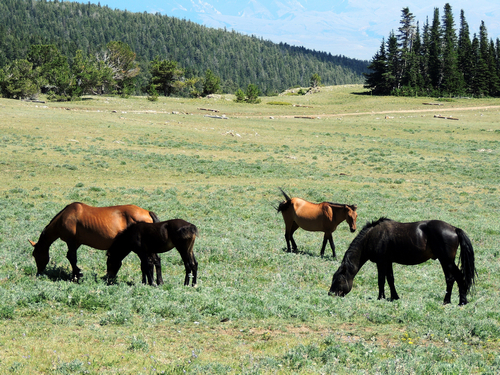 The Pryor Mountain Wild Horses are the descendents of these important horses. They are truly horses with a heritage. 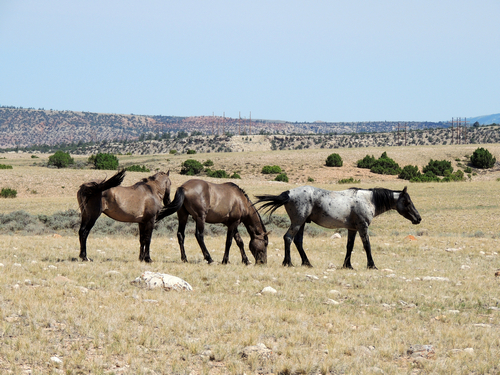 ​The Pryor Mountain Wild Horse Range was established in September of 1968 by Secretary of the Interior Stewart Udall. Such an action was groundbreaking; the PMWHR was the first public wild horse range established in the United States. It also preceded the writing of the Free-Roaming Wild Horse & Burro Act 1971 by three years, though the passing of the 1971 act allowed the PMWHR to be expanded. Since then, the range boundary has changed; and today it covers over 38,000 acres of land. 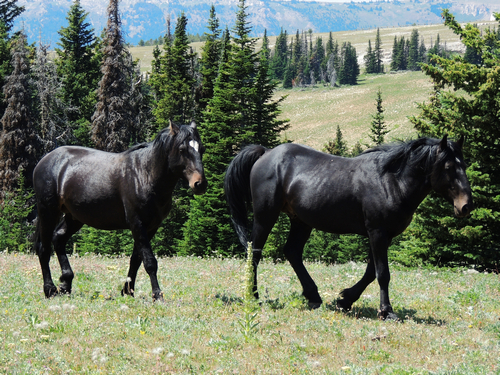 The PMWHR straddles the Montana-Wyoming border and covers Forest Service, National Park Service, and Bureau of Land Management land, though the BLM oversees horse-related activities. ​We noticed LARGE piles of horse manure throughout the area and wondered what was going on. No horse could poop that much in one shot! Turns out these are territorial markings left by rival males. One horse would add to the pile, another would smell it then they would whinny and show slight aggression to each other. There are 140-160 horses on the range at this time. Since they have no natural predators, the BLM rounds up the extras every few years and makes them available for adoption. Wild horses live in "bands" of 3-6 horses, led by a dominant stallion. Bands generally stay apart from each other, but are more tolerant of being close as they congregate for the summer in the cool 7000' high elevation location where we saw most of them (North Gate). Some bands remain in lower 4000' elevations all summer (Mustang Flat). If you have an RV, the best place to stay is Horseshoe Campground. 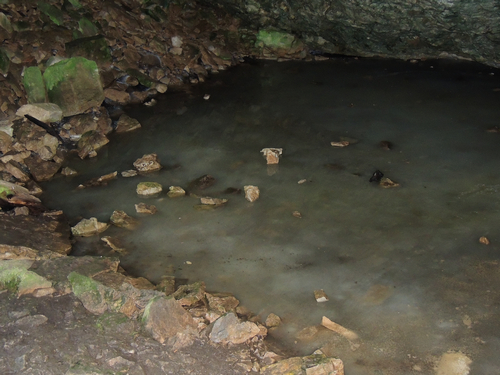 ​The Big Ice Cave formed in limestone. A short paved path leads to the cave. 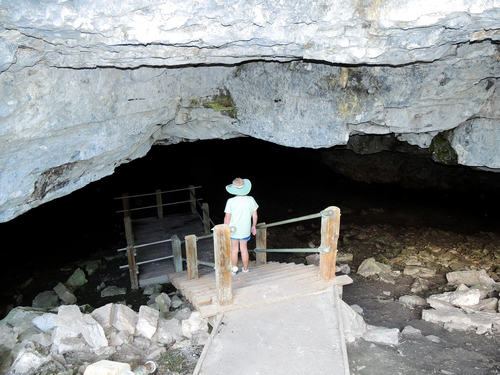 The cave is 7,530' elevation and stays approximately 32 degrees year around. The thick limestone is an excellent insulator and keeps cave temperatures generally very constant. This allows ice to stay frozen throughout the year. In the winter, cold dense air sinks down into the cave. In the summer, chilled air remains in the bottom because it is trapped below the warm surface air. 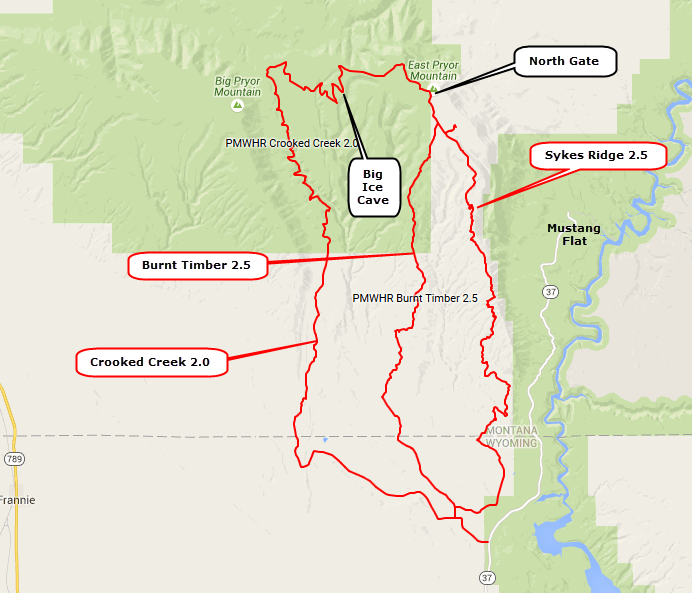 Crooked Creek is the easiest road, but it is 36 miles from pavement to the North Gate. Took us a strong 2 hours. This road will take you to the Big Ice Cave. Burnt Timber barely makes a 2.5 rating and is only 16 miles from pavement to the North Gate. This one took us 1 1/2 hours. Sykes Ridge is a good one to avoid. Relentless ledges. Took forever. ​We suggest you make a loop of Burnt Timber and Crooked Creek. A very few horses summer at Mustang Flat. Passenger car accessible.